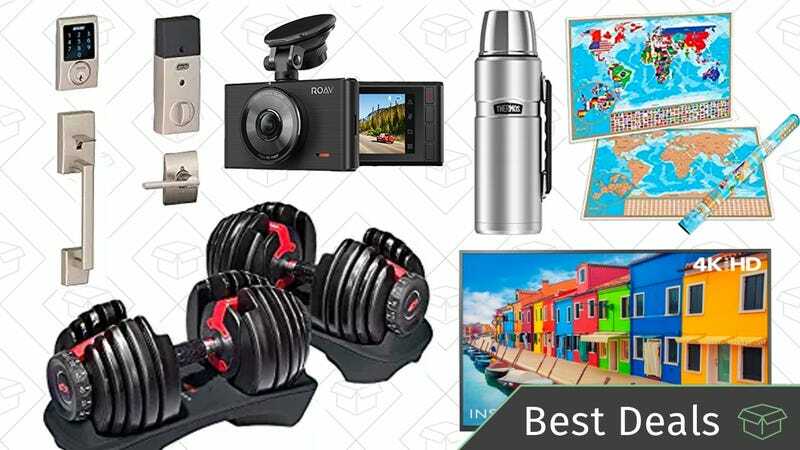 A Bowflex adjustable dumbbell set, a Schlage touchscreen deadbolt, a dash cam, and more make up Saturday’s best deals. Grab this 50" 4K TV with a built-in Roku at Best Buy for $320. That’s $60 less than usual, and a $100+ less than its Amazon price. If you can’t get enough of our readers’ favorite rechargeable batteries, you can pick up a dozen Eneloop AAs for just over $2 per battery today. Anker’s following up its incredibly popular dash cam with a new model, and you can race over to Amazon to snag one for $45 with code BDCAMEC2. We wrote more about the cables over on Gear, but the long and short of it is that between the extreme durability and the lifetime warranty, it’s quite possible that this will be the last Lightning cables you ever have to buy. The 6' model is the one on sale this week in white. If only the best will do, the current gen GoPro HERO6 is down to $350 on eBay right now. That’s $50 less than the current going rate, and $150 less than it cost at launch. Never worry about forgetting your keys with this Schlage touchscreen deadbolt. It doesn’t connect to your phone or Wi-Fi, but it does have a built-in alarm system, solid 4.3-star rating, and an all-time-low price that’s $100 less than usual. Get a visual reminder of all the places you’ve been to (or travel plans you need to make) with this scratch-off world map, just $20 with code MAPDEALS and when you clip the $4 off coupon. Vacuum insulated stainless steel is the best way to hold your favorite drink, and this massive 40 ounce Thermos can keep a beverage hot or cold for a whopping 24 hours straight. Name brand or not, $20 is a fantastic price for any vacuum-insulated container of this size. Typically priced around $40, this highly-rated Willow & Everett whistling stovetop tea kettle can be yours for just $31 today after you clip the 5% coupon, the lowest price we’ve ever seen. Sure, there are easier ways to make tea, but if you prefer the traditional method, this tea pot is for you. Amazon’s newest sample box is for you to sample some of Gatorade’s non-sports drink products. As with all sample boxes, after you buy this, you get an equal credit back in your account to spend on select Gatorade products. Assuming you use the $7 credit, it’s like getting the samples for free. These $7 gloves (with promo code XJZ2UX6N) let you grab a hot pan out of the oven, pull meat right off a grill, or even turn logs in an active campfire without getting burned, like some kind of kitchen superhero. We’ve seen silicone barbecue gloves for less than this in the past, but these are rated for much higher temperatures, and should be more flexible as well. It’s impossible to have too many water bottles. You need a couple for your desk, your car, to work out with, etc. This qottle 30oz vacuum sealed bottle is just $8 with promo code QOTTUM75, and is offered in a couple of different colors. Some may think they’re “Etsy’s answer to a straightjacket,” but you can’t deny these mermaid blankets are trendy. If you or someone on your gift list wants to dive in, you can enter the promo code XRPCTIAB to get this adult-sized mermaid tail blanket for $14. After the 40% off discount, this Aveeno lotion is down to just $2 when you Subscribe & Save. Just remember you can cancel at any time after the first order ships, and unsurprisingly, this is add-on item, so it needs to ship with a larger order. This AccuStrike AlphaHawk Nerf gun is selling for just $16, the lowest price ever. What are you still doing here?